Solvaderm's Cellmaxa Review: Does It Work? Find The Truth Here! Cellulite is a condition of the skin that causes the surface to appear bumpy and uneven. While it can affect men and women, it is usually worse for females, showing up mainly on their thighs, hips and buttocks. Cellulite affects people of all body weights and shapes and cannot be reduced simply through diet and exercise. The product Cellmaxa addresses the problem of cellulite by reducing the fat cells and preventing more cellulite from appearing. The product is made by the company Solvaderm who sell it through their official online website. Cellmaxa costs $44.95 per bottle of 240ml and consumers can also receive a 10% off discount coupon. All purchases have a 60 day money back guarantee and the website includes contact details for the company plus additional skincare information. The ingredients in Cellmaxa are designed to not only rid the body of existing cellulite, but also prevent any more from occurring. It uses a number of beneficial complexes including Adiposlim and Adipoless, plus Hyaluronic Acid. Adiposlim and Adipoless work together in promoting the breakdown of fat cells, using the fat as energy while simultaneously stopping the production of new fat cells from growing. The formula rejuvenates the skin, improving the look of imperfections, softening and hydrating while also protecting from environmental damage. The Hyaluronic Acid in the formula is a commonly used skin care ingredient as it has the ability to hold large amounts of water, plumping the skin and making it appear more even and smooth. This helps diminish the bumpy texture of cellulite affected skin. Other ingredients used in the formula include Squalene, Sorbitan Laurate, Quinoa Seed Extract and Phenxyethanol. For best results, the manufacturer recommends that the product is applied twice a day to the affected areas, and massaged into the skin in circular motions. The fact that Cellmaxa uses two proven complexes is obviously a good sign and means that it should, overtime, produce significant results. It would be helpful if all the key ingredients were explained in detail and if the manufacturer’s website included customer testimonials and more clinical study data. 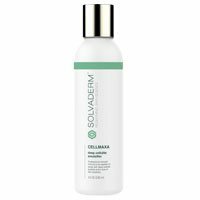 It is appreciated however that all Solvaderm products are professional strength and that they appear to also be favored by skincare professionals.